We had such a fun weekend celebrating Easter with both sides of our families. It is such a special time remembering the ultimate sacrifice of our Savior and the gift of our salvation. I made these delicious scones over the weekend and I thought I would share with you all. It’s hard to find a recipe that is gluten free and that doesn’t taste like cardboard! Nothing beats fresh blackberries, raspberries and blueberries in the Spring and Summer! These scones are so flakey and buttery and perfect for a Saturday morning treat! Preheat oven to 375 degrees. Combine flour, sugar, salt and baking powder in a bowl and cut in butter until it crumbles. Add milk and vanilla slowly into mixture and stir. (For best results do not over-stir) Gently fold in berries until well incorporated. Optional add in chocolate chips and omit lemon glaze. Divide dough into 2 balls and roll one at a time into a disk and pat to into a 1 inch thick round on a lightly floured surface. Cut into 8 wedges and sprinkle with granulated sugar. Bake scones for 18 minutes or until light, golden brown. While they are baking combine powdered sugar, lemon juice, water and vanilla in a bowl and stir to combine. When the scones come out of the oven, spoon lemon glaze over the top of each scone and let cool. Enjoy! I hope you love these scones as much as our family does! I’d love to hear your favorite gluten free recipes! One of our favorite weeknight dinners that is so fast to throw together! I love a quick, easy and healthy meal that I can throw together in a hurry after we get home from school or baseball practice. I’ve started keeping a large mix of fresh veggies in our refrigerator that can be easily mixed and matched with a different protein. After I added fish back into my diet, I started making a lot more salmon than we previously ate. We all love it including the kids so it is a win-win. I try to only buy fresh caught salmon that has not been farm-raised or had any coloring added. I find not only is this healthier, it also tastes better too! Preheat oven to 375 degrees. Cut all veggies into large bite size pieces and place into gallon size zip-lock bag. (If you’d prefer to use a more earth-friendly option, place in large bowl) Add maple syrup, oil, salt, pepper and garlic salt to veggies and shake or mix until well incorporated. Rinse salmon in the sink and place in large baking pan and drizzle with teriyaki sauce. Sprinkle on sesame seeds. Line the sides of the baking pan with veggies and place in pre-heated oven. Bake 35 min or until vegetables are cooked through. About a year ago I began having terrible gall bladder pain that was beginning to be a more consistent, daily irritant. Not only was it painful but I was getting fearful of needing surgery to get my gall bladder removed. To back up even further, I had developed a condition with our baby girl’s pregnancy called cholestasis. I had never had any complications in pregnancy before so it took awhile (and many doctor visits and calls to the advice nurse complaining that I thought I was having a reaction to lipsense, lol) to figure out what was going on. That experience is worth a separate blog post, so for now I’ll stick with the eventual aftermath of the cholestasis. I am so curious to hear what other momma’s have experienced cholestasis, so I will follow up with that post soon! I began to realize that the new pain was not going away without some change on my part and I began to do research on what people had successfully changed to impact their symptoms. In my mind we already ate a healthy diet, that was well rounded but it didn’t seem to be helping. After giving birth to our daughter, the doctors told me that the symptoms of the Cholestasis generally resolve on their own without doing anything to help. Years prior I had gone gluten and dairy free to help with my thyroid, so I couldn’t even cut out the normal offenders. What I began to learn was that after your gall bladder and liver have been compromised, like in the case of Cholestasis, it is crucial to cut down on any fat in your diet, both for pain management of the symptoms and also eventual healing. Since we already ate a more limited diet, was breastfeeding and was on the petite side, I was concerned about cutting more out. Sometimes in life you just have to trust the research and pray it helps. I immediately cut meat and animal fat out of my diet and I began craving more greens. We already ate salads with dinner every night but I could tell my body needed more than this. I love smoothies so I just began throwing in all the leafy greens I could find. Green smoothies were already becoming a fad at this point but I didn’t set out to duplicate a fad, it was just what my body was telling me it needed. This smoothie slowly changed everything and over the next couple months my symptoms completely went away on their own without surgery. I slowly began to add fresh fish into my diet. After not having any meat, salmon tasted like a dream. I have continued drinking this green smoothie daily for the last year and have been the healthiest I’ve ever been. Time will tell if my gall bladder will continue to heal and not need surgery but I am hopeful that this lifestyle change will be a lasting solution. 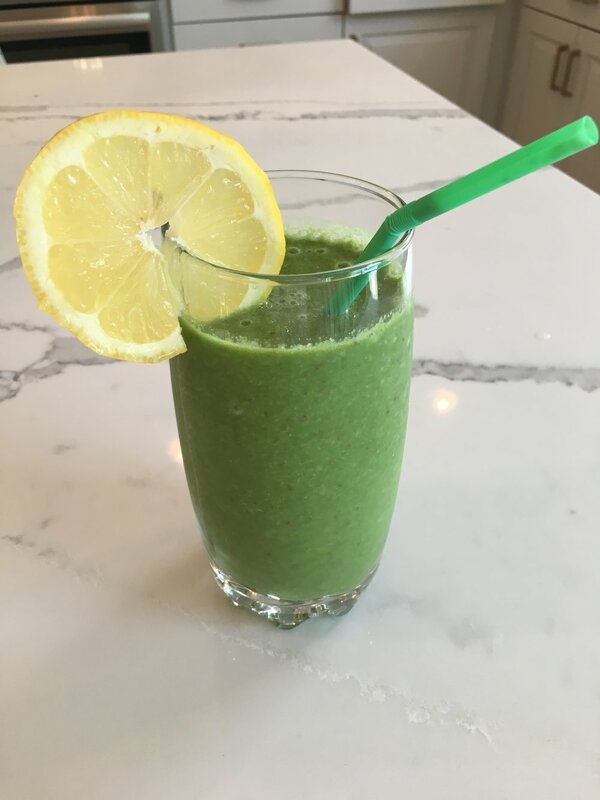 I began giving this smoothie to our kids and my husband and they all love it and drink it daily as well. (most days, without bribes) I am definitely not a doctor and cannot give any medical advice but I wanted to share what has been a helpful and life-giving change in mine and my family’s health. Please share your favorite smoothie recipes in the comments!